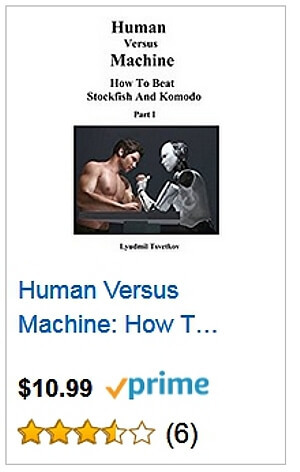 Recently a tournament chess player called Lyudmil Tsvetkov send me an email and asked me to write a review about his book "Human versus Machine", which is available at Amazon.com. The opening concepts in this book are very deep and can be checked and evaluated by computer software. I have done it. This book has nothing to do with programming, but with chess itself. With deep chess! Computers think deeply and are tactical sharks. To stand a chance you should keep the position closed. This aspect is researched and the author comes to remarkable conclusions. We are talking about deep chess concepts, that you can learn here. For example, the Stonewall Attack from White shows an incredibly deep attacking concept, which I have never seen before. I will apply this in my own games myself from now on. It makes me understand this chess opening much better now. An amateur player can learn a lot from this example and can apply the recommendations, concepts and ideas himself in his own games. Lyudmil is also explaining how you can play against the French Defence as White and transpose this opening into a King's Indian Attack, this way you create a closed position which the computer can't really understand well enough. After that you can create a dangerous winning attack. This concept is simply fascinating. Random guesses or not, the moves played by Stockfish are sound and good variations. I have checked them myself. The main thing is, that if an amateur chess player dives deeply into the concepts that are shown in the book, he will surely improve his game. This is the most important fact for me as a chess player, that something is revealed that I have not known before. There is no such thing as a "best variation" in chess, just different ideas and concepts are played and evaluated. Everybody knows that there is not only one path that leads to glory, there are many. Study and understand the selected concepts in this book and you will surely improve your game. Very important are the comments after the moves, they are spot on and can be a real eye opener to many amateur players. The author is not trying to prove that he plays better than Stockfish. He is a strong tournament chess player who shows the weaknesses of even the best computer chess software. Nothing else! These chess programs do not understand closed positions very well. This fact is researched and clearly demonstrated in the book. This chess book is definitely different and unusual and the amateur chess player can only get better at chess reading it. It's as simple as that.